Gen. Irwin: The men don't want TV or better food, they just want you resignation. Col. Winter: Well then I better go pack. It is rare for a director to continually improve his work from one film to the next, but former KABC film critic Rod Lurie seems to be doing just that. With a powerful debut film (Deterrence), and a sophomore effort (The Contender) that found its way onto numerous top ten lists, Lurie is quickly proving himself to be an undeniable talent in Hollywood. His latest film is The Last Castle, a throwback to the days when film characters were fully realized, and performances from top to bottom are impeccable in their quality. When three-star Gen. Eugene Irwin is sent to a military prison known as the Castle after being court-martialed for disobeying a direct order that resulted in the deaths of his men, his intention is to quietly do his time and leave. Quickly, though, Irwin sees that the manner in which the Castle is run is less than fair, resulting in a power struggle between himself and the meek, sadistic Colonel Winter (Gandolfini). 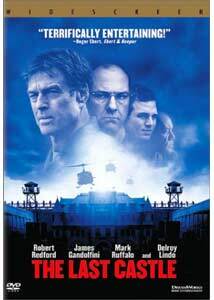 As the two men begin a chess-like battle, Irwin earns the respect of his fellow inmates, and soon leads them in a revolt against Col. Winter for control of the prison. Though many claim The Last Castle to be an action-thriller, it is, in my opinion, more a tightly-wrapped character study of two men locked in mental battle. Irwin and Winter battle through events and double-crosses rather than actual warfare, until the film's action-filled finale. What Lurie does so well is that he wisely gives us reasons to like and dislike both the protagonist and the villain. Irwin is guilty and rightfully imprisoned at the Castle, while Winter, though sadistic and unlikable in nearly every aspect, is in the right: that is, it is his job to control the prison. Lurie, who himself is a graduate of West Point like several characters in this film, handles nearly every scene with perfection and skill. His camera work is at one moment vast, as it spans the prison yard, and in another, contained in the cells of the prisoners. His work isn't perfect, as there are moments of implausibility as well as plot threads left hanging; one in particular is the appearance (and disappearance) of Robin Wright Penn as Irwin's estranged daughter. Lurie's direction of The Last Castle, while not as masterful as others released last year, uses enough of the magic he showed in his previous films to signify that he is now an A-list talent. For all of the technical achievements, there is little to dispute that the film is largely a showcase for the talents of Redford and Gandolfini. Redford makes his return to the screen after a three year absence, and his time off has certainly not hampered his abilities. As Irwin, Redford crafts a subtle performance which, in the hands of another actor, may have been too over-the-top to lead us to care for the Irwin character. James Gandolfini, as I have said in the past, is perhaps my favorite actor working today, and with The Last Castle he adds another amazing performance to his illustrious career. Gandolfini's performance has a subdued energy lurking beneath the surface, and we see the shell of a man who perhaps has been passed over too many times and is frustrated in his post at the Castle. Supporting roles by the gifted Mark Ruffalo and Delroy Lindo are equally terrific. Image Transfer Review: Presented in its original aspect ratio of 2.40:1, the anamorphic widescreen transfer looks great, though some flaws detract from the overall grade. Sharpness and detail are nearly perfect throughout, but at moments the film suffers from softness. In chapter 2, as Irwin and Winter look out onto the prison yard, this flaw is most prevalent and is not nearly as bad again. Colors are perfectly rendered; the harsh grays of the prison interiors and exteriors look great, while the lush greens and blues outside the prison walls show no signs on bleeding. Edge enhancement is a problem at times, with minor halo effects noticeable throughout. Audio Transfer Review: As is the case with most DreamWorks releases, The Last Castle carries both Dolby Digital 5.1 and DTS sound formats, and it is safe to say that each mix is of the highest quality. As is to be expected, the split surrounds really come into use during the uprising and are used more for ambient sounds during the larger portion of the film. The .1 LFE channel provides several room-shaking moments, while the score by Jerry Goldsmith is reproduced beautifully. A head-to-head comparison between the two tracks yields no clear winner, though as is often the case, the DTS mix seems to be a bit louder. Extras Review: A screen-specific commentary by director Rod Lurie is easily the best extra feature on the DVD, as it is an informative and entertaining track. What I enjoyed most is the way Lurie clearly points out mistakes he made and moments he would like to be able to correct, given the chance. The track is filled with several fun anecdotes involving Redford (who would read a dictionary between takes) and Gandolfini (who took to playing chess in his off time) as well as the implications the September 11th attacks had on the film. It is revealed that composer Jerry Goldsmith recorded the most beautiful piece of music used in the film on September 11th, as well as which moments Lurie believes played better and worse after the attacks. The only other major supplement is a collection of nine deleted scenes that are available with or without commentary by Lurie. Each clip is presented in anamorphic widescreen and, for the most part, each scene was rightfully excised. One in particular, featuring Winter controlling the yard while countless prisoners wait their turn, may have helped to explain just why the prisoners had such hatred for the man. A twelve-minute HBO "first look" entitled Inside The Castle Walls is largely promotional, though it does offer some nice information about the cast and crew, as well as the location in which the picture was filmed. The theatrical trailer is shown in anamorphic widescreen, and production notes and extensive cast and crew bios and filmographies are offered. Anchored by two terrific performances and a skilled turn behind the camera by Lurie, The Last Castle is perhaps the most underrated film of 2001. It isn't groundbreaking cinema, but it offers the sort of rousing adventure, intricate character study, and gifted storytelling missing from so many films today.